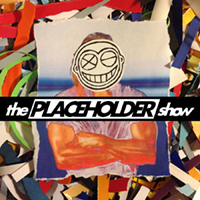 The Placeholder Show is a one-person sketch/storytelling/multimedia anthology of incidents, presented by J.D. Renaud (Winnipeg Comedy Fest, Oddblock), for your consideration. These may include stories about the devil, outer space, crude drawings of horses, and, if there's time, an uplifting message at the end. For people who like that sort of thing. It's The Placeholder Show. We Ruin Things For A Living. The new show from the writer/director of Damn Your Eyes (5 STARS - CBC) and Story Hole (4 STARS - Winnipeg Free Press). Once again I started my Fringe this year with local Comedian/Artist/Storyteller J.D. Renaud’s show. I have always enjoyed his performances and find they are the perfect way to get into the Fringe. Those familiar with him will know him for his great stories told with accompanying pictures/video or his simple, yet amazing, cartoons. I’m blown away by how every year he somehow finds some weird true story from long ago and then enthralls the audience in the way he presents it. This year that story opened the show and was about a race horse from 1923 and it was great. He then goes on with some stories from his own life and wraps it all up with a nice bow with the first story he created for kids. If you want to see some great storytelling and be fully entertained, and maybe have a beer as well, go check out this show at Wee Johnny’s.